The establishment and training of the first Durham Pals battalion. 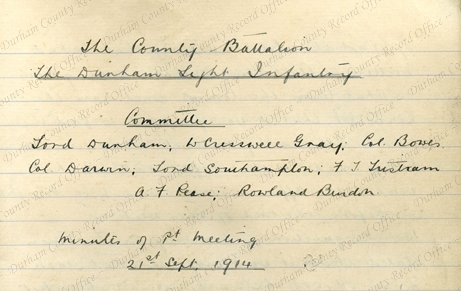 This document contains the minutes of meetings of the committee which raised the battalion, and includes information on funding, the enlistment of men, and the setting up of the training camp at Cocken Hall. The minutes of 23 November 1914 record the departure of 500 men to assist in the defence of Hartlepool. On 26 December there is a report of the bombardment of Hartlepool, and the minutes of 16 January 1915 confirm that the Hartlepool detachment had been reunited with the rest of the 18th Battalion at Cocken Hall. The minute book is part of the Rowland Burdon papers, in the Clayton and Gibson solicitors’ collection. Rowland Burdon was a member of the County Battalion committee.